Chinese new year is coming up this Monday, January 23 (2012). It will be the year of the Dragon, which makes me chuckle because my dad is a dragon and he likes to tell everyone that he’s a dragon. In my childhood years, he always told me that the dragon was the best. I would look at the Chinese zodiac place mat at Chinese restaurants and find my dad, my mom, my sister, my grandma, and me. I knew by heart what we were: dragon, snake, horse, rooster, and pig, respectively. In my mind I saw a cartoon family of these creatures sitting at the dinner table together – my family. For several years now it has no longer become a question of whether or not to make traditional Chinese dishes to celebrate the lunar new year, but a necessity. It is the one holiday I take seriously. I largely ignore Christmas. I consider myself lucky to stay up for the western New Year. But Chinese New Year is the time when I spend several days gathering and preparing these special foods, all the while deep in thought thinking of loved ones both here and gone. Remembrance is an important part of the holiday and we honor those who have passed on with an extra place setting at the table. They are meant for your ancestors, but in my case I have one for my sister, Kris, and now one for Grandma. I woke up the other morning and began jotting down the menu for this year. Potstickers, cellophane noodle soup, lucky ten ingredient vegetable (rui tsai), stir fried rice cakes, and soybean sprouts. Simple, right? I also had a strong desire to make tian tang, a sweet soup that my Grandma always had on the stove whenever we came to visit her in California. Why did I never ask her for a recipe when she was alive? I choked back the lump rising in my chest and gave my mom a call. Mom listed a ton of options as the soup is quite flexible, “If you can’t find lotus seeds, you can make it without them.” “No Mom, I want to make it the way Po po made it.” I knew she understood. I know she misses her too. It’s a good thing I have a strong visual memory otherwise this illiterate Chinese girl would be screwed when shopping for Chinese ingredients. I had gone grocery shopping with Grandma countless times. She taught me to select the sweetest fruit, the freshest greens, the most tender shoots, the best quality noodles. Between my memory, my mom’s instructions, and Google, I was able to identify the ingredients I needed at the big Asian market in Broomfield (POM: Pacific Ocean Market). When I found the first one – the dried lotus seeds, I picked the bag up in my hand and examined them under my fingers through the plastic. And then I began to cry. Someone was turning down the aisle, so I quickly wiped away the tears and continued hunting for the other ingredients. Who knew grocery shopping could be so emotional? Among all of the recipes I had to shop for, this dish proved to be the most elusive. Yet with the help of a Chinese employee and my (really crappy) Chinese, I was able to find everything. The red dates seemed smaller than what Grandma typically had, and the longan (dragon eyes – it’s a fruit) were whole rather than the pieces I was used to seeing/eating, but this is Colorado – I’ll take what I can get! I found the ginkgo nuts in the refrigerated section. 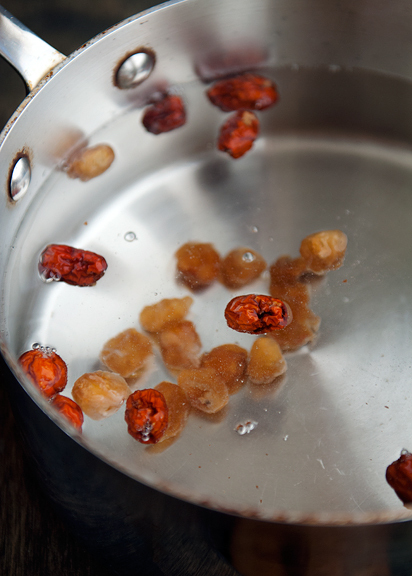 The dried lotus seeds must soak and cook first and separately. This takes the most time, so start a few hours ahead: soaking for an hour, simmering for another hour until they are fat and tender, then draining them. I rinsed then simmered the red dates and longan for 20 minutes. They should tint the water a tea color. 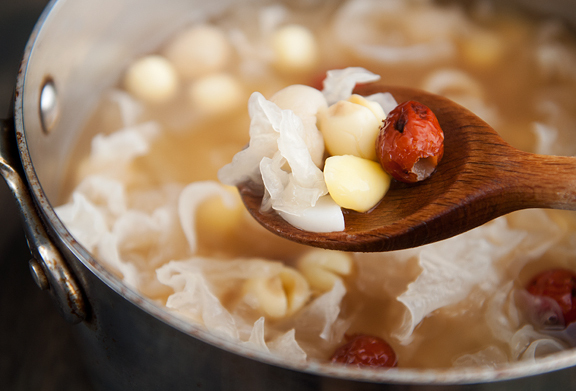 The delicate dried white fungus (similar to the tree ear fungus, but white) rehydrates quickly in cold water. I chop off the hard base and also pull the larger heads apart into bite-size pieces. You can leave the rice cakes whole or dice them like I did so they’re more like tiny chewy bites in the soup. Rice cakes are important for the new year (nian gao = higher year). 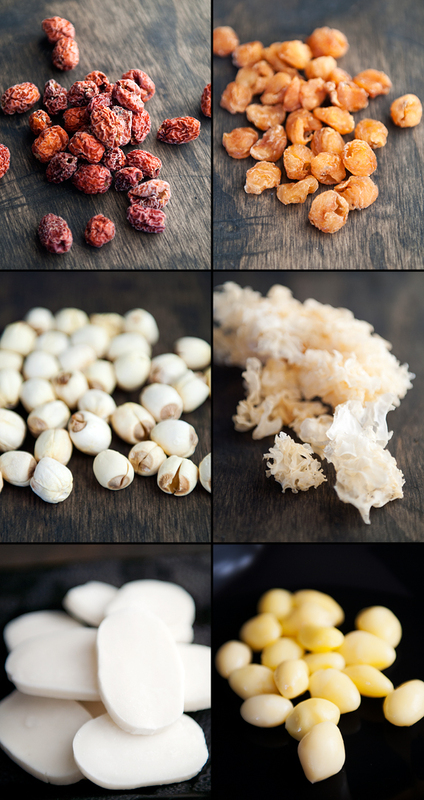 Take care not to overcook the red dates, rice cakes, or the white fungus because they will disintegrate. That’s why the timing is important, because every ingredient cooks at a different rate. After 20 minutes, you can add the rest of the ingredients and simmer for another 15 minutes. The soup itself has a subtle earthy sweet flavor. I wasn’t so fond of it as a kid, but I’ve really grown to like it as an adult (what did I know as a kid anyway, right?). Like my mom said, you can put anything you want in the soup, but I’d say the red dates and longan are essential for flavoring. Next time, I’ll reduce the amount of white fungus because that stuff expands when rehydrated. As for everything else – it represents good luck, good things for the new year. And it connects me with my family. Soak the lotus seeds in water for an hour. Drain. 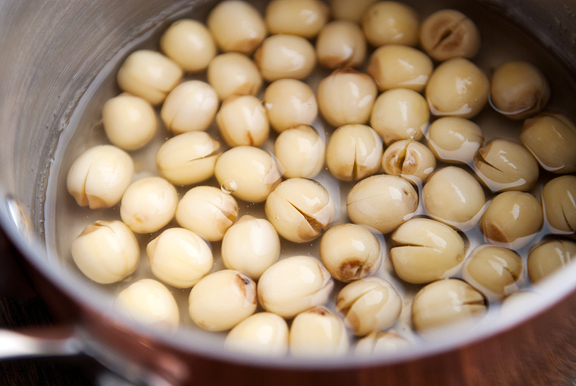 In a small saucepan, bring 3 cups of water to a boil and add the lotus seeds. Reduce to a simmer and cook for an hour or until the lotus seeds are tender. Remove from heat and drain. Set aside. Rinse the dried red dates and dried longan with water. In a medium saucepan, bring 6 cups of water to a boil. Add the dates and longan to the water and reduce to a simmer. Simmer for 20 minutes. The water should turn a tea color. 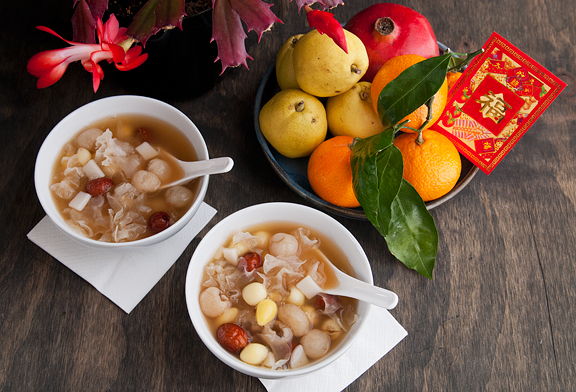 While the dates and longan are simmering, soak the dried white fungus in a bowl of cold water. It should soften within a few minutes. 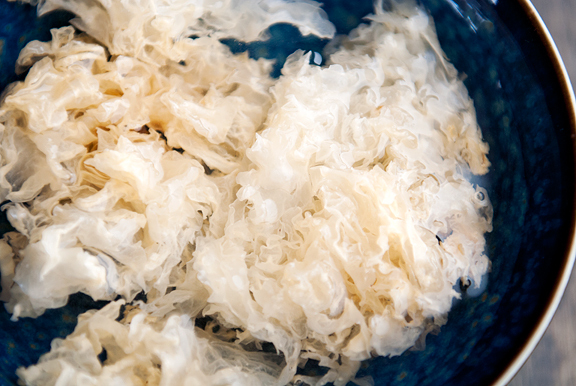 When the white fungus is rehydrated, rinse off any dirt then cut off the hard base and rip the fungus into bite-size pieces. 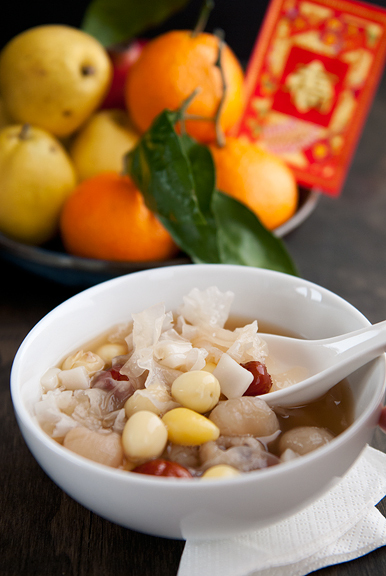 After the dates and longan have simmered for 20 minutes, add the lotus seeds, white fungus, rice cake, and ginkgo nuts to the soup and let simmer for another 15 minutes. Add sugar to taste. Serve hot or cold. Serves 4-6. I really appreciate how you honor your family. My grandpa died last month, I am wondering if I’ll be able to make his BBQ ribs or buy a box of Jiffy corn muffin mix without tearing up. We made the muffin mix in a green tupperware bowl, and he let me stir & lick the bowl & spoon. Happy New Year, Jen. It warms my heart to see how you are using food to connect with your family, your tradition, and comfort you in your grief. My menu is completely different, since my family’s heritage is German, not Chinese. But I do the same, and I’ve been known to wipe away many a tear while cooking. 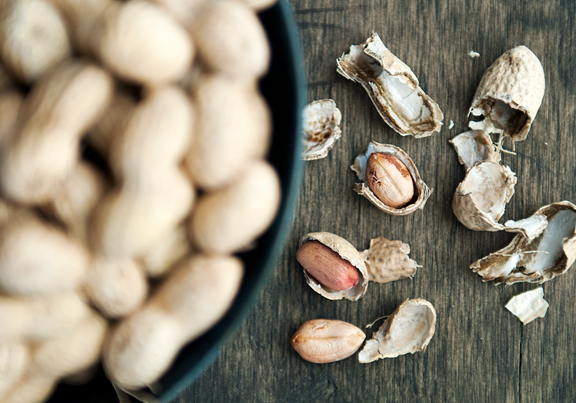 Food is so much more than fuel for our bodies, isn’t it? In your case, it’s art, love, respect, honor, healing — nourishment, in all it’s many forms. A lovely tribute, I’m sure your grandmother would be so proud. Happy New Year! Beautiful post and tribute, Jen. 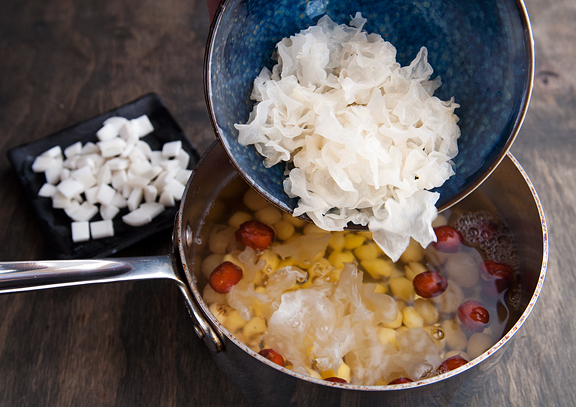 Is the white fungus a form of mushroom? Is it safe for immunocompromised individuals to eat? i do this, too, jen–i swear i can feel generations of women standing behind me when i make the simplest of the old family recipes. oddly, it’s the potato salad that makes me cry, and for the same reasons. i wish our culture here in the US had more of a way of honoring those who are gone like the place you set at the table–that would have made the loss of my brother and this past holiday season without him easier to bear. i think it’s the age of the chinese culture itself that lends such gravity and acceptance. i love that. I simply adore this post, Jen. Thank you so much for your beautiful words! Gong Xi Fa Cai! Thank you Jen for sharing the traditional recipe and beautiful pictures. I enjoy your posts and look forward to more in 2012. Wish you and yours health, wealth and happiness in the dragon year. Happy New Year Jen! 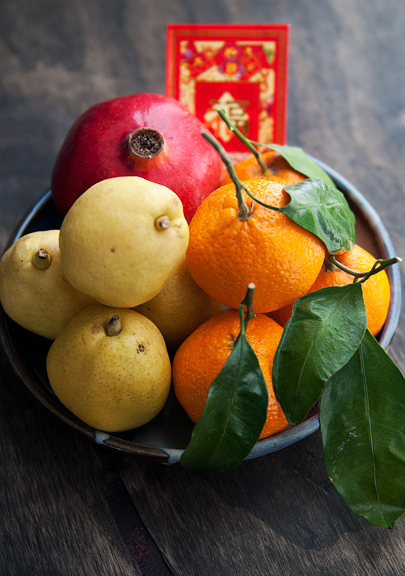 Your tian tang looks delicious and I’m inspired to serve it for Chinese New Year. May sweet things come from your mouth this year of the dragon. I didn’t know what lotus seeds loked like. So cool. Love how you recreated this soup for Chinese New Year – it’s the best when you figure out how to make something from your ethnic heritage isn’t it? Happy New Year! Amazing! I love your dedication to finding ‘just the right’ ingredients. Your love of family shines through, beautifully. I’d give you a big hug if I was there Jen. The soup sounds interesting. I cannot imagine the taste as I have never tried some of the ingredients. Chines New Year celebrations seem a lot more healthy than our Christmas celebration food. Absolutely loved this recipe. I live in Hong Kong and love the food here. Can easily make this one at home!! Kung Hei Fat Choi! I love love love your blog. 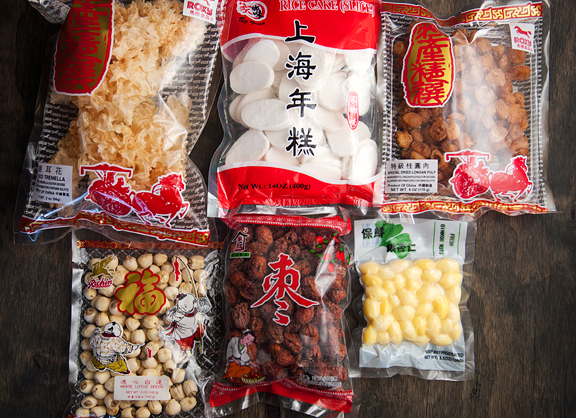 So, I live in NYC and as I’m reading your post about not being able to find larger dried dates in Colorado, I would love to send you something from NYC’s Chinatown! Is there a specific ingredient or snacks you would like? Jeanette – yes, it’s so true. Happy new year! Barbara – sending you a hug right back, my dear B.
Purabi – ahhh, lucky you!! :) Happy new year! Michelle – you’re so sweet to offer! Thank you :) It’s fine, I know where to find them in California which I frequent, but I really appreciate your generosity. Just promise me you’ll go out and eat all of that GREAT food in NYC! :) Happy New Year!! I don’t think I’ve ever seen them in pieces. Aside from when they fall apart during cooking. Me and my sister used to sneak dried longan out from the fridge to eat when we were kids. And we definitely have STRONG sweet soup memories, also made for us by our grandmother. We generally eat them cold and a soup like this one is liable to have whole hard boiled eggs in it. I think we would use slabs of Chinese brown sugar (brown candy) in it though since I think my mother has something against white sugar in soups like these. And your father is absolutely right — the Chinese do believe dragons are the best zodiac animal to be. I suspect there are many couples trying to have kids this year because of it. My family is still in the midst of making all the various cakes (gao) since we got off to a late start this year.